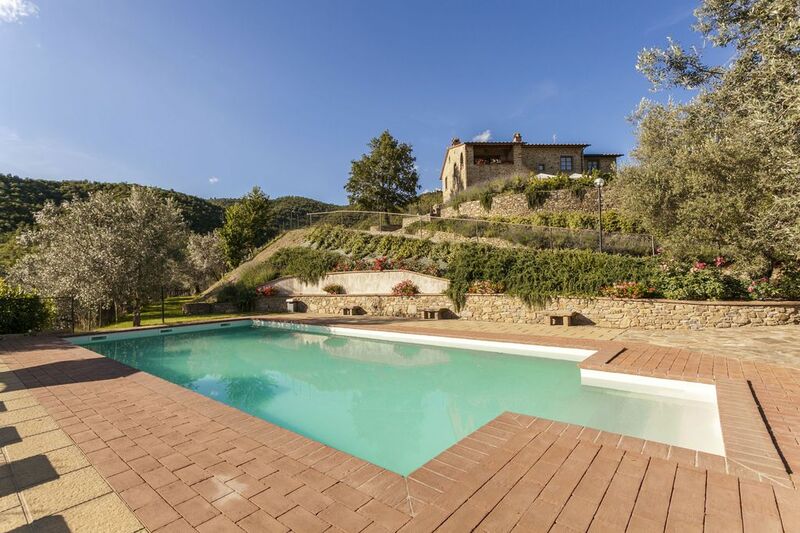 Villa Margarita provides a fabulous combination of a great location and charming Tuscan style. A recent renovation offering lots of space, light and amazing views of the countryside along with a fabulous pool. It will easily appeal to discerning families looking for a bright and airy home and perfect location to explore and enjoy Tuscany and Umbria. This villa is for up to 13 guests. With 6 our bedrooms and 6 bathrooms. plus an additional single bed. The accommodation is over two floors - On the lower floor, 2 bedrooms with en-suite bathrooms, super large reception room, dining room and large kitchen with full amenities. On the upper level there are a further 4 bedrooms with ensuite bathrooms, a further large sitting room, terrace and a small kitchen for cocktails, coffee etc. Situated above a small picturesque Tuscan village it is both totally private and tranquil with lovely views of the Val di Chio, the castle of Montechio and Tuscany’s highest mountain Amiata. The main town of Castiglion Fiorentino is just a short drive whilst the larger Cortona is about a 20 minute drive. The property is uncluttered with a spacious and relaxed layout. Here you will find all the right amenities to make your holiday to Tuscany complete. Villa Margarita is offered as a large family home for up to 13. Around the villa are lush green lawns and further afield are olive groves and other Tuscan scenery that embrace the property giving it substance and charm. Outside there are plenty of places to relax, dining al fresco and relaxing perhaps in the shade by the lovely pool with its perfect vistas in all directions. The restoration of this charming property focused on bringing out the clean lines and simple beauty of this old-rustic dwelling. The renovation was completed in the first week of June 2013 thus providing a home that is easy, lovely and welcoming. We stayed six adults and one three year old for five nights here. The house is on a huge hill (quite a treck up a steep narrow dirt road) so the views are spectacular, like out of a dream. The house is huge, but note that one of the six bedrooms is in the attic, so there is no window. We put the toddler there bc none of the adults wanted it bc the other rooms are all quite lovely. The main floor master is particularly huge and has full windows viewing the gorgeous mountains. The kitchen on the second floor was closed, but that was okay bc the main floor one is well-equipped. We didn't use the pool beacuse it was too cold. Noting for future guests - heat is not included and was 120 euro for five days. Laundry detergent, paper towels and trash bags are also not included. There are plenty of nearby grocery stores to purchase these things. The location is about 30 minutes from Cortona, but the other local towns like Montalcino, Montepulciano and Pienza are all about an hour drive. The drives are gorgeous though and an experience themselves, just good to know for planning sake. We didn't hear much from the property owners other than when the alarm system was beeping and the wifi stopped working (the wifi in general is spotty due to being on top of a huge hill, bring a hotspot if you plan to work). They were very prompt about the exact checkout time, so leave yourself time to pack up. The house could use some minor updates like new pillows and some new bedding (a clothes dryer would be ideal, but I get these aren't popular in Italy and the clothes and dish washers worked well) and the couch is clearly well loved, but overall was mostly clean and had the feel of a classic Tuscan villa. Wonderful house with amazing views in the heart of Tuscany. My group of seven thoroughly enjoyed "Villa Margarita" for our holiday in Tuscany. The house is well designed for groups, with six bedrooms and six bathrooms, a large living area on the main floor, a lovely terrace and a swimming pool. Castiglion Fiorentino is a charming hilltop town and its central location makes for easy "day-tripping" to Florence, Siena, Pisa, Montepulciano, San Gemingano and many other towns. Laura and Domenic were very gracious and responsive hosts. All in all a deligthful place to spend a Tuscan holiday! What more to want - but a lovely home to enjoy two weeks in Italy. The large bedrooms with nice clean bathrooms, the (two) kitchens one small at the top of the house for the lazy amongst us.. and lots of space for us all to find our own space as well as great communal dining etc. Good wifi and easy communication with the owner. The pool and its setting marvelous to enjoy the views, and a little corner close to a olive tree with lovely natural shade.